This sweet coffeecake, offset by tart cranberries and crunchy pecans, knocks pineapple upside down cake of its long-held upside down throne. Or would that be onto the throne? If it’s upside down I don’t see how it can stay on a throne in the first place. Really, upside down cake royalty should have a pin-on metal that stays put no matter what position it’s in. Just look at those beautiful vibrant berries and all that drizzling goodness. Whatever the award being given, this cranberry version takes the cake. 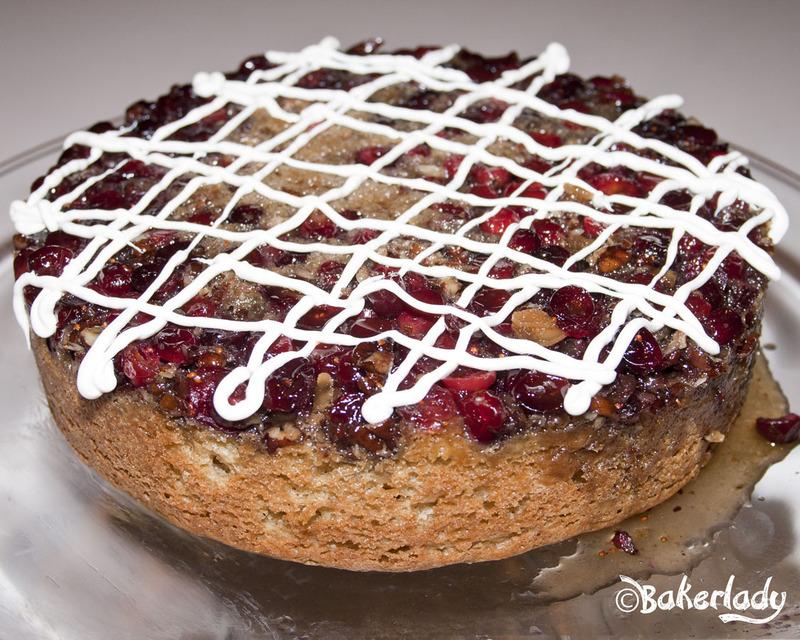 (insert groan over terrible pun here) Serve it with the bright gorgeous cranberries as the star, or drizzle with a little white chocolate for an absolute visual show stopper. 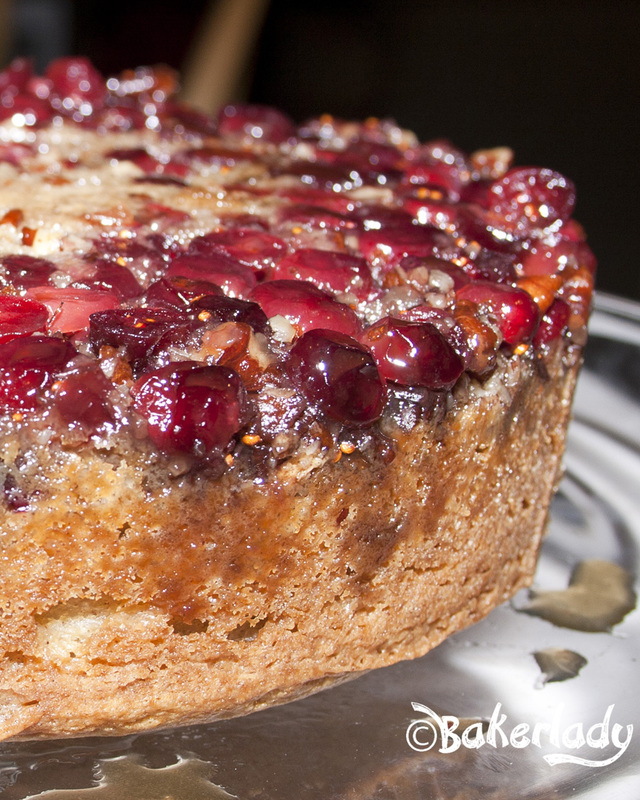 The topping of butter, brown sugar, cranberries and pecans gets baked on the bottom and then ends up perched on top of a perfectly spiced coffeecake. It’s stunning. Rich caramel sauce drenching every morsel of the crunchy nuts and tart berries. Delicious. This would be perfect to bring to Thanksgiving dinner. 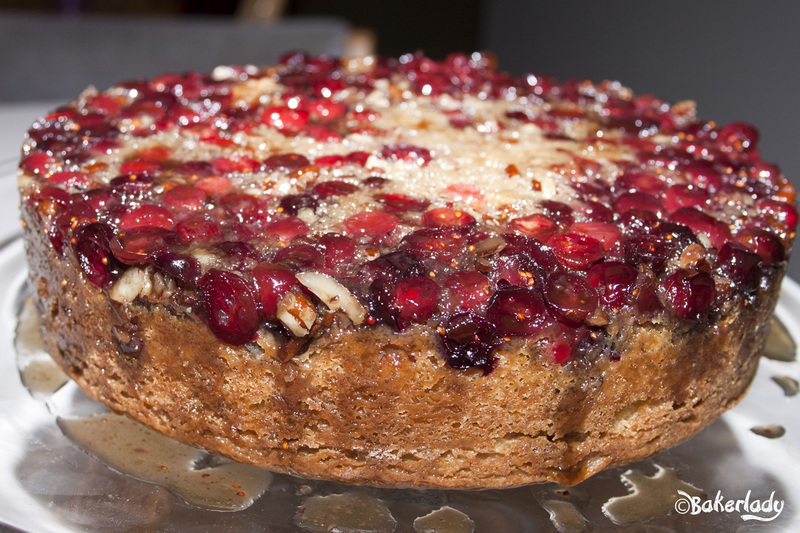 The cake is lightly spiced and the whole experience of the crunch and zing will make you extremely thankful. 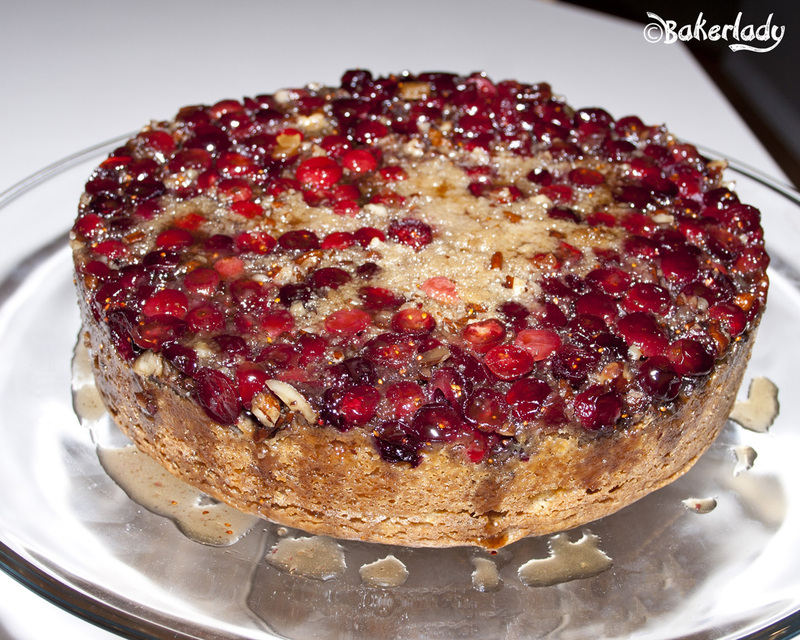 What’s goes with turkey better than cranberries? 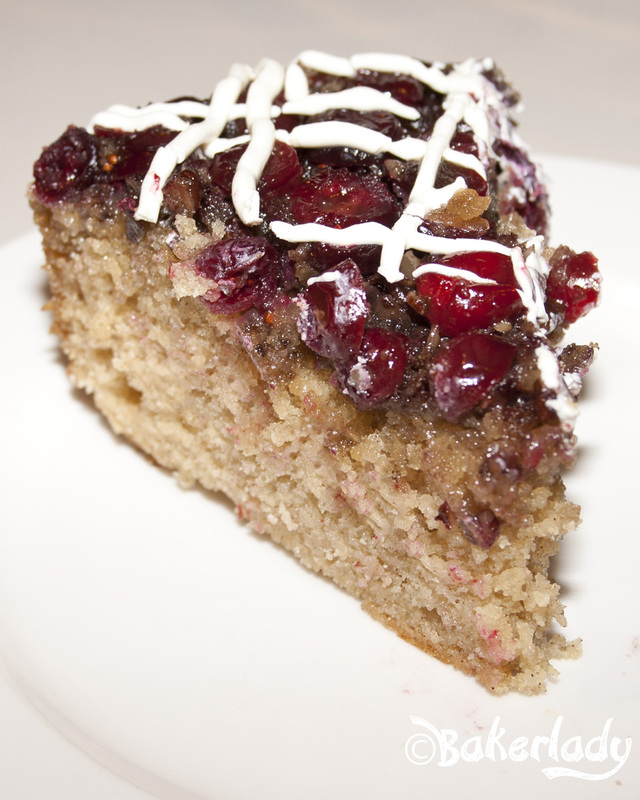 The spot where the topping meets the cake is just out of this world with the sauce melting perfectly into the coffeecake. 1. Preheat oven to 325 degrees F. Wrap the outside of a 8 inch springform pan with aluminum foil to prevent leaking. Sift together the flour, baking powder, baking soda, cinnamon and salt. Set aside. 2. In a saucepan over medium heat, combine brown sugar and 1/3 cup butter. Bring to a boil, then pour into bottom of springform pan. Sprinkle with cranberries and pecans. 3. In a large bowl, cream together the butter and 3/4 cup sugar until light and fluffy. Beat in the eggs one at a time, then stir in the vanilla. Beat in the flour mixture alternately with the sour cream. Pour batter into prepared pan. 4. Bake in the preheated oven for 75-80 minutes, or until a toothpick inserted into the center of the cake comes out clean. Cool in pan for 10 minutes, then invert onto serving platter and carefully remove pan. Drizzle with melted white chocolate or candy melts if desired. Serve warm. Gorgeous huh? I love how beautiful it is. And tastes amazing too! This bookworm is interested in all things historical. Thanks for the link! wow, is this a showstopper or what!